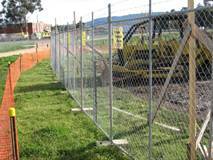 Temporary fencing is a portable fence made up of a group of panels fitted with chain wire mesh, where the upright of the adjacent panel is engaged in a hole in the plastic base, the temporary fence then interconnects at the top of the panel by a clamp. with 1.8 metre chain wire infill. weighing 4 kg when empty and 24 kg when filled with water. 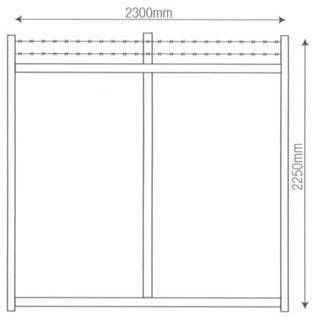 Hinged gate systems can also be used to enable vehicular and machinery access. A new bracing system is also available that can be attached to the panel to further ensure the integrity of the fence system in areas prone for high wind. Chain mesh at a construction site. Chain Mesh used while construction decisions are being made. In addition to chain mesh fencing, shadecloth prevents people looking into the site. 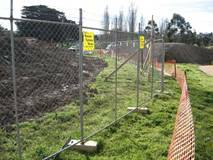 Temporary fencing works in conjunction with the building being opened. 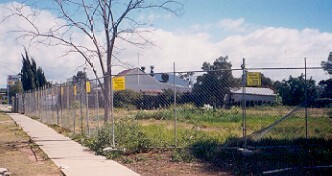 Pedestrians could still enter the site. Prevents access to dangerous vacant land. Reduces illegal parking & rubbish dumping. 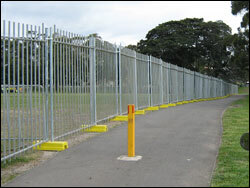 Ideal for road closure & screening walkways. This example was opposite Flinders Street Station.